The Ghana Education Service (GES) is calling on students who sat for the 2017 BECE facing challenges with their postings to report to their schools immediately. This was revealed in a press release addressed to the General public. 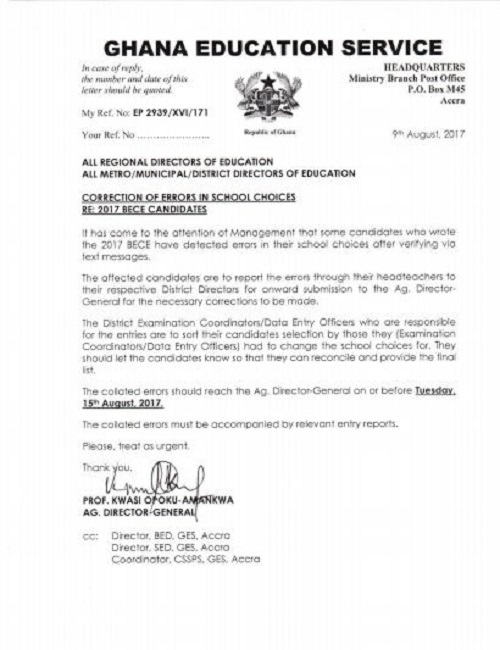 According to the statement, the GES’ attention had been drawn to the fact that some students observed some errors in their school posting via text message. In view of this, the students are to report through their headmistresses and headmasters to the District Directors for onwards submission to the Ag. Director General for the necessary errors to be corrected. It also stated that, all the District Examination Coordinators/Data Entry Officers responsible for the entries are to sort their candidates’ selection by those they had to change the schools for. Students are therefore being entreated to make their reports on latest by Tuesday August 15, 2017 which is the deadline for submission for all collated errors to the Ag. Director General. Attached is the full statement by the GES.